I am meat-drunk. I feel like I have been larded with drippings and slathered on toast. You see, I had brunch at Hawksmoor Spitalfields today. This is not brunch for the fainthearted or weak-willed. There is no heart-healthy option. Nor is this brunch for vegetarians. No. This is brunch for meat-eaters and boozers, and I love it. On arrival it’s plain that there is one thing that must be ordered: “The Hawksmoor Breakfast.” Described as “Smoked Bacon Chop, Sausages (Pork, Beef, and Mutton), Bury Black Pudding, Short Rib Bubble & Squeak, Grilled Bone Marrow, Trotter Baked Beans, Fried Eggs, Grilled Mushrooms, Roasted Tomatoes, Unlimited Dripping Toast & HP, Onion, and Bone Marrow Gravy,” and served in what one of my dining companions described as a “giant metal bucket,” this dish is a STEAL at £35 for two persons. There’s nothing subtle about the Hawksmoor Breakfast. As friend B said, this is man food. It’s a fry-up for great big lads, and I swear I could feel it putting hair on my chest. However the food is also really bloody nice. Roasted bone marrow is just about one of my favourite things to eat. Smeared on Hawksmoor’s grilled brown bread with just a hint of char, it is high-cholesterol HEAVEN. The bacon chop was glorious. It was thick, smoky, salty, and cooked to pale pink porky perfection. The bubble and squeak – made with kale instead of cabbage, and opulently rich with chunks of savoury short rib – was like the best bits from a really good Christmas dinner. I loved the baked beans, which were given a little unexpected dimensionality by aniseed and tomato. The black pudding was exactly what a black pudding should be: rich and tender, with just a hint of funk. Even the grilled tomatoes and mushrooms were tasty. In fact (and it pains me to say this), the only thing that I wasn’t totally ecstatic about was the sausage. Not because it wasn’t very good, because it was. But because it wasn’t one of the best sausages I’ve ever eaten, which (spoiled little tart that I am) I’ve come to expect from Hawksmoor. Even though I felt like I’d been punched with a giant meat fist after slogging away at the Hawksmoor Breakfast, the cornflake milkshake also had to be ordered. It is a naughty little treat. It took me right back to when I would dawdle over my frosted flakes until the milk turned all corny and sugary. I thought it could have been a bit thicker, but as one of my fellow diners pointed out, it is a delicious breakfast milkshake. Which, as a concept, I really can’t argue with. I also like that most of the other items on the brunch menu are £10 and under. It makes this brunch feel doable for those of us who don’t have the dosh for the full Hawksmoor monty. In fact, the only thing I want, and the thing that would make this brunch reign supreme over all other London brunches, would be that Hawksmoor bring back its bottomless Bloody Mary. C’mon Hawksmoor, what do you think? 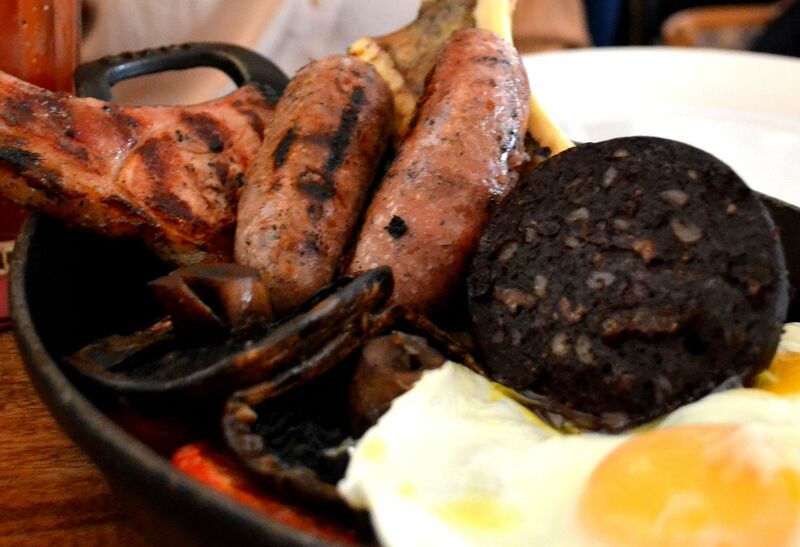 This entry was posted in British, Brunch, Kinda Splurgy, Must try!, Shoreditch by Susan. Bookmark the permalink. Unlimited Bloody Marys? Now that’s a brilliant concept. I know! Dangerous, too, like all acts of genius. Have you been to Regency Cafe for Full English? It was super good.